So you think you know how to make a half decent stir fry? Perhaps even egg fried rice? 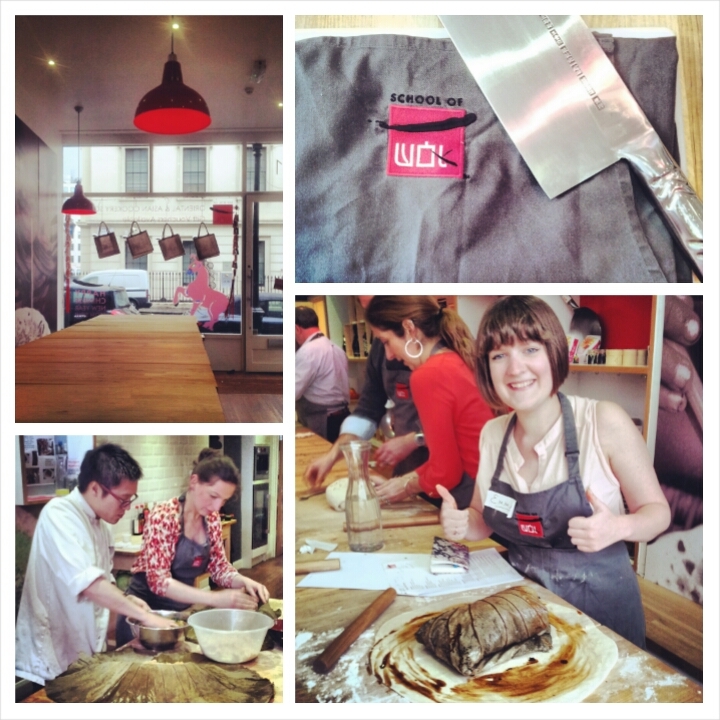 With School of Wok now is your chance to become a Wok Star serving up authentic Chinese dishes in no time at all. When a dream trip to China at the start of this year fell through (Jon had some unfortunately timed work commitments that scuppered my plans…) I knew I had to find some other way to spend my time off. After trawling Time Out, the Stylist magazine and many pages on the internet I eventually stumbled across School of Wok. School of Wok is an Oriental and Asian cookery school located in Covent Garden. Not only do they teach knife and wok skills, but dim sum masterclasses and they even do tours of China Town. Well if I wasn’t going to China, maybe I could have a taste of China come to me? So, as 2014 came around and my six weeks of holiday began I decided to contact the school and book myself on to a course. After a couple of emails back and forth I soon settled on the Flavours of China Full Day Course and I popped it in the diary. All that was left to do now was to wait for the day to come around. On the day of the course I arrived bright and early. The school is conveniently located seconds from Charing Cross and minutes from Leicester Square making it easily accessible by a wide range of people. With that in mind our class was attended by all sorts of people some coming from London (myself included of course) and others from Kent and the Home Counties. I was greeted by the lovely Jeremy Pang in the School’s shop front/classroom/dining room and he seemed undeterred by the other class members who had called in sick (leaving just him and I for the first part of the day) and the dark clouds gathering outside. Despite the rain Jeremy was really enthusiastic and off we went out into the cold for the first part of the day – a tour of China Town! So what makes Jeremy an expert in this area? As we wandered the streets of China town Jeremy told me of the area’s history and how this tied in to the history of his family. Jeremy’s family came over from Hong Kong in the sixties. As we visited various sites, including Kowloon Bakery he told me how it had once been owned by his grandfather – and not a lot had changed! It turns out his grandfather had also worked in the noodle factory just a few streets away. So I was soon in no doubt that Jeremy knew his stuff! 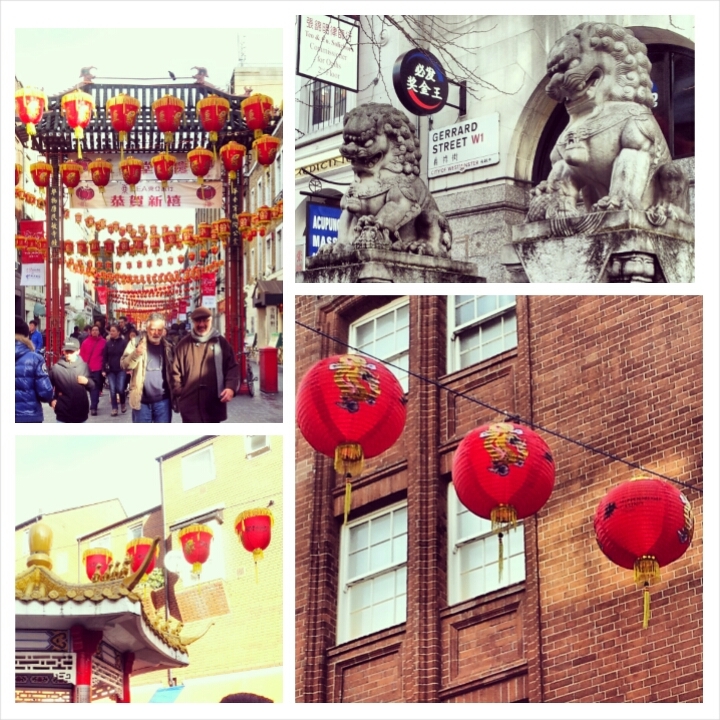 China Town can be daunting if you’ve never been there before and you don’t have a guide. Among the good restaurants are the not so good and it was fantastic having someone able to point out the best supermarkets depending on what you’re after. I now know where to go for my equipment, fresh vegetables and even live fish! After a breakfast of Char Siu Bao we continued our shopping, picking a few bits up for the class along the way. I chose not to buy anything, instead taking all of Jeremy’s fantastic advice on board. A few days later however I came back to buy a few select ingredients – I needed time to gather my thoughts otherwise I would’ve bought the lot! Jeremy was fantastic as we walked the shops even giving me cooking tips enabling me to better cater for Jon (my partner) who some of you will know is vegetarian. I now have so many ways to jazz up tofu I think it will take months for us to try them all! For the added tour around China Town you do pay extra but it was well worth the money. I now know the difference between green pak choi (firmer and preferred in Shanghai) and white pak choi (juicier and eaten in Hong Kong) as well as gai lan (Chinese broccoli) and morning glory. After a bubble tea and a dim sum lunch (fried vegetable dumplings and steamed meat dumplings) we headed back to the school to join the rest of the group for the afternoon’s cookery class. When we arrived Stefan (another one of the school’s chefs) had bought out some incredibly yummy brownies and after a little chitter-chatter among the other students we began our class. Jeremy began by telling us how ninety per cent of the cooking is preparation – something we’d come back to later with the ‘wok clock.’ With that in mind we started with a lesson on knife skills. I say knife…all the preparation was done with a traditional meat cleaver. It was the first time I’d used a meat cleaver and despite Jeremy’s lesson in the ‘crab’ I was a little apprehensive. It turns out I needn’t be, and after a few slow goes using a slicing motion down and forward, keeping the tip of the knife on the board and slicing all the way through, I soon got the hang of it! We chopped the classic Chinese trio of ginger (slices, matchsticks and diced), garlic and spring onion before learning a slightly trickier technique, the roll cut. Jeremy went through each step, patiently demonstrating first so we could all see. Then, with his encouragement, we had a go and I’m pleased to say I succeeded! Once knife skills were over and we had chopped more veg for the various dishes, we went on to making the dough for the Beggars Baby Chicken. When I learnt mandarin at law school it soon became apparent that in Chinese culture dishes are often named after stories and legends. Beggars Baby Chicken is no different. The story goes that a pauper stole a chicken from the emperor. When the soldiers were chasing him he dug a hole and buried it so he wouldn’t be caught with the stolen goods. A few days later he came back to retrieve it, only to find that it had been perfectly cooked! In China the cooking techniques now reflect the legend and the chicken is stuffed, marinated and cooked in clay. We however mixed together a simple water and flour dough in which to bake ours. Part of this full day course was a wine tasting carried out by A Grape Night In. A Grape Night In are based in South London and are a wine school that aim to bring wine tastings alive! 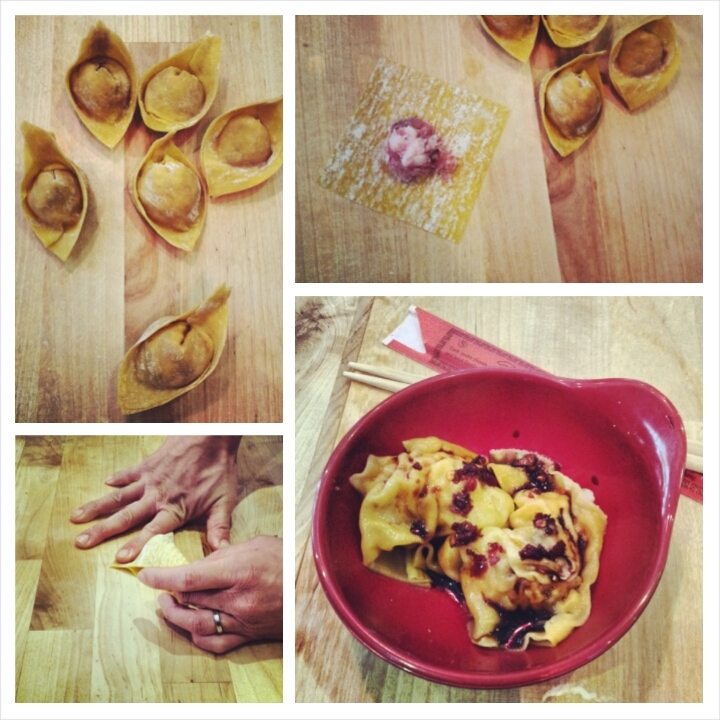 First we tried a fresh, bubbly Prosecco to lift the wontons. Later we would have two wines paired with out meal. After our snack, we had our wok session. Jeremy made handling the wok look incredibly effortless and I wondered how I would ever have strong enough wrists to master the wok toss (a fantastic way of cooling the wok down along with removing from the heat and folding the ingredients). It turns out the key to a good wok is actually that it is incredibly light. We all groaned and laughed as Jeremy told us there is no point spending money on expensive, heavy non-stick pans you see in shops like John Lewis and that instead the light and cheap woks available in China Town would last a life time as long as they were seasoned and cared for properly. 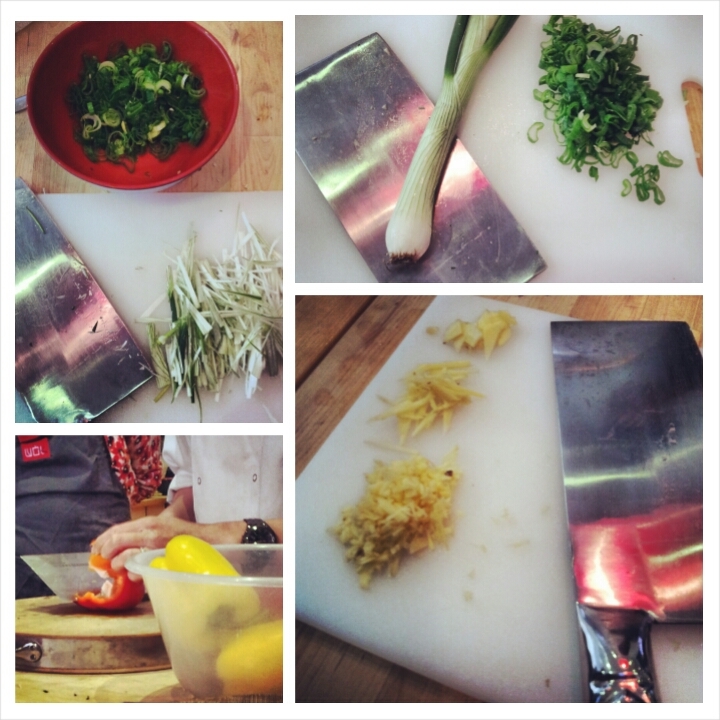 With two students to a station we began cooking the prawn filling for our Prawn, Pine Nut and Lettuce Wraps. This is where Jeremy’s ‘wok clock’ came in to its own. Wok cooking happens so incredibly fast that it’s important to have your ingredients laid out in such a way that you know exactly what ingredient is going in next! That way you are less likely to panic and ruin your dish. I got in a couple of wok tosses and before I knew it the dish was done. Next we made a simple yet tasty Chinese Spinach and Goji Berry Broth that would be served alongside the chicken, rice and prawns. The hard work was done. By mid-late afternoon the whole class was back around the long table sat enjoying the food we had cooked that day. It was incredibly rewarding not only learning new skills but tasty the end product! School of Wok is still quite young; it started in 2009 with Jeremy teaching in people’s homes and has only been based in Covent Garden since 2011 but they are doing a fantastic job. The classes are small enough that you’re able to get one on one advice (at one point I had a lazy crab and Jeremy personally saw to it that my cloth under my chopping board be wetter when my board had started to slip), but they are also big enough that you’ll get a chance to meet other like minded people. I had such a wonderful time learning new skills and meeting wonderful people – is it any surprise I’ve already decided which course I want to book next? Steamed Bun Fun here I come! Classes start at £45 per person for a one-hour Quick Fire course. 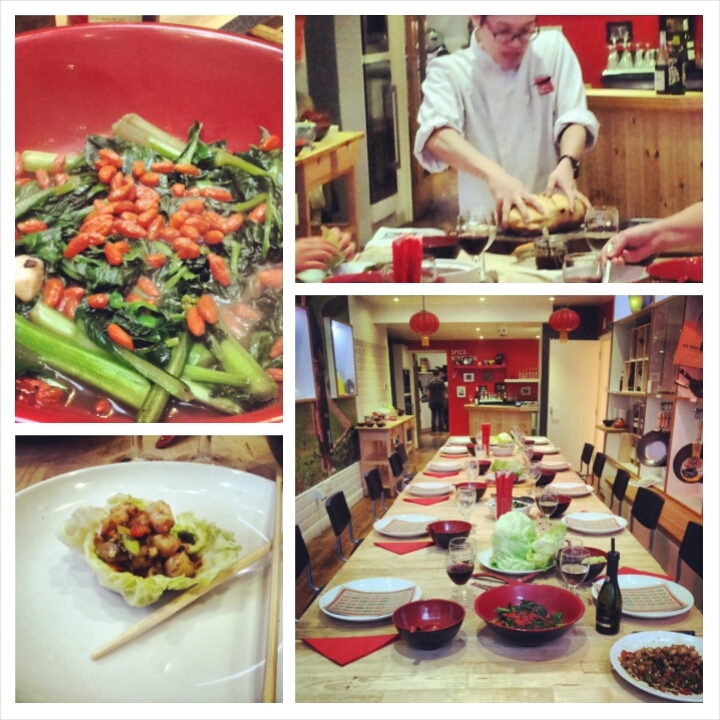 I took the full-day Flavours of China Class, which costs £160 per person – I received a 10% bloggers discount. Please note that all opinions expressed in this post are my own! It sounds like a fantastic course and one I haven’t heard of before. 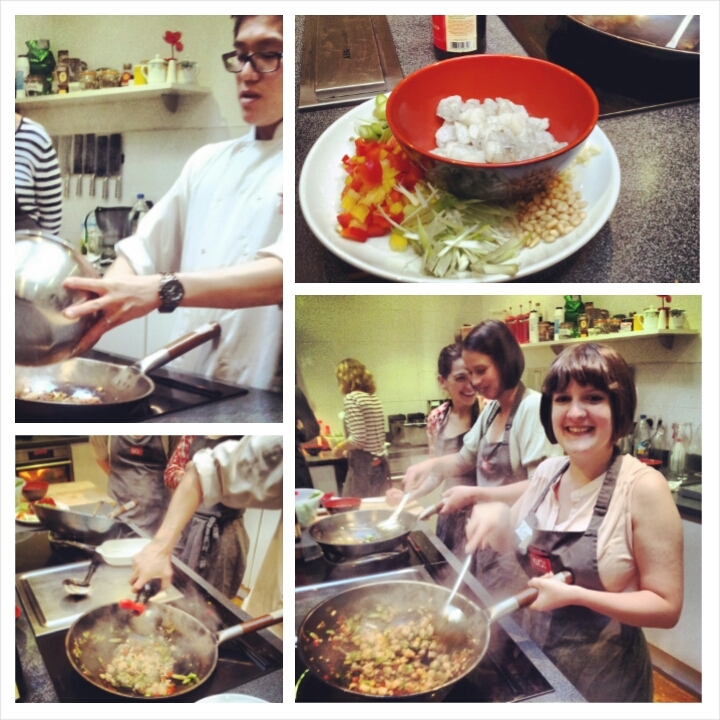 I did an afternoon cookery class in China about 4 years ago and learnt so much. I would love to do another one but with children now it’ll be a long time till I can go abroad to do one.